One of the small surprises of the iPad announcement was that it was running on Apple’s own custom silicon. Well, that’s true to an extent, but it’s not like Apple actually invented the processor in-house. It’s just not OEM hardware. In fact, other guys are running with many of the same parts. The A4 is a custom implementation of the ARM A9 processor, also found in Snapdragon (running the Nexus One) and Tegra (running the Zune HD). The difference is there is a GPU mated with the A9 in Apple’s design, probably to help offload the graphics work and keep the interface smooth. Beyond this (ARM licensing the CPU and GPU to Apple), it’s mostly speculation. 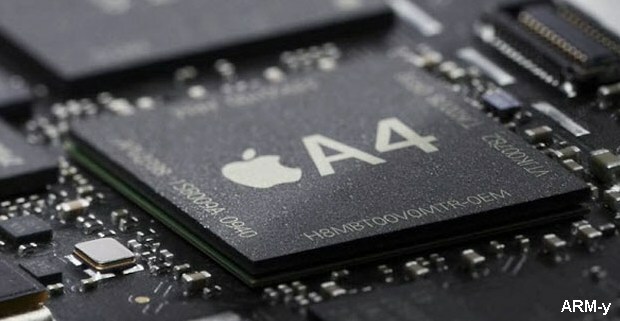 But there’s room for processor shrinks and even overclocking; the A9 has been clocked to 1GHz by everyone because it stays cool, but if Apple (or anyone) were to apply some better cooling, they could take it all the way up to 1.3GHz. The chip itself, which contains other components not yet revealed, is supposed by many to be manufactured by Samsung, like the one in the 3GS, which incidentally contains the A9’s predecessor, the A8, clocked to 600MHz.